In the weeks leading up to the E3 show, we all heard the rumours of a new Kirby game being possibly in development so it should come as no real shock that one actually materialised during Nintendo's Press Conference. 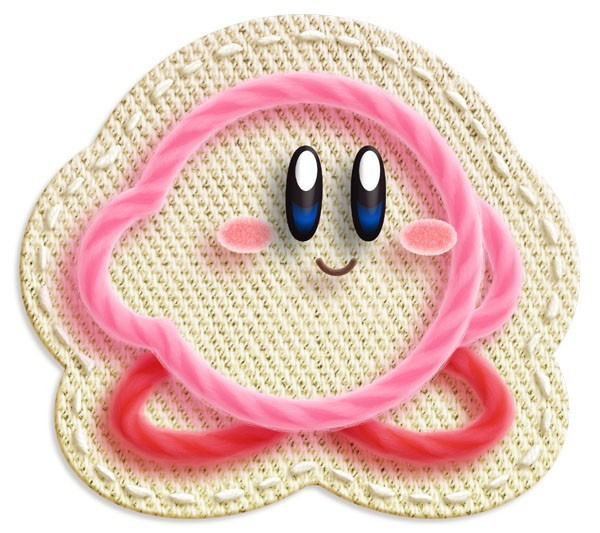 What is surprising is that Kirby's Epic Yarn is not only a 2D side-scroller for the Wii, but it also sports one of the most unique graphical styles we've seen to date on the console. 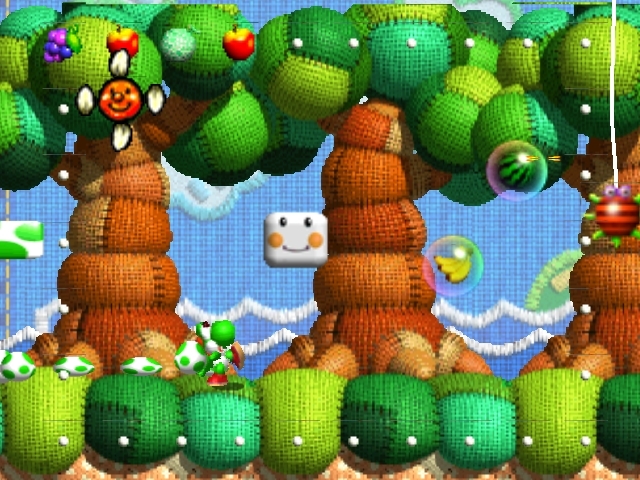 The entire game uses the "yarn" theme to full effect. Not only do the backdrops all have a cloth look and feel to them, Kirby and the many enemies are also equally unique in their makeup. 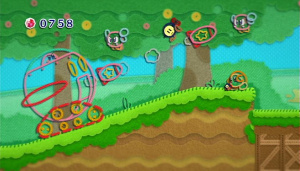 You'll even find the gameplay set to match with Kirby shooting out his yarn lasso to grab enemies and other items throughout the levels. These range from peeling layers of cloth off to form new sections that can be traversed to unzipping zippers to reveal new parts of the level. Every inch of this unique package works together to form not only a common theme but also a completely unique gameplay experience. While Kirby has seemingly lost the ability to inhale enemies and absorb their unique powers, he does have a brand new set of abilities, from floating around as a parachute to turning into a small honking car to run through the level on wheels. 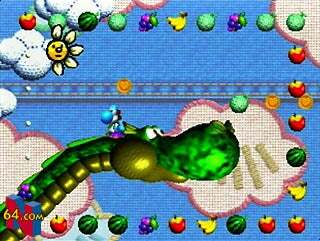 The controls are silky smooth and despite the game featuring the lower level of difficulty so prominent throughout the series, you'd be hard-pressed to find a more enjoyable playing experience than the one found in Kirby's Epic Yarn. To further enhance the game's rampant playability the developers have included a fun multiplayer cooperative gameplay mode to allow two players to enjoy the game together. While you can help each other out, you can also grab the other player and toss them around the level. It's more humorous than anything else, but when you start working together to progress through the levels, you'll see the draw of this multiplayer feature. 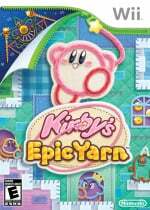 Nintendo had quite a large number of solid titles on display on the E3 showroom, and Kirby's Epic Yarn was certainly one of the most charming. With an absolutely incredible visual style, not to mention some fresh gameplay ideas, you can't help but fall in love with the game from the moment you begin playing it. As great as it already was to hear Nintendo announcing a brand new Kirby game during their press conference, it was even more exciting to get a chance to take the little pink blob for a spin. It was easily one of the best games available for play at E3 and one that is now moved up quite high on our most-wanted list of holiday releases. look very intreasting to say the least i wonder if the epic yarn thing also means will get more story. I've never been a Kirby fan, but I think the visual style looks really cool here, refreshingly new. The gameplay trailer also reminds me of what Super Paper Mario did, it changed some of the rules for platform games. Looking forward to this one now. This just looks gorgeous, instabuy for me! I may have only played and beaten Kirby's Dreamland(great game, but far too easy) and Kirby's Canvas Curse(innovation at it's finest, one of my favorite DS games period) as far as the Kirby franchise goes, but this is an instant buy for me. I've never seen anything like this before, the boys at HAL are genious! After I'm done finishing up Legendary Starfy and Wario Ware Touched! I'll be giving Kirby's Adventure a go on the VC hehe. Still need to play Kirby Super Star Ultra, Dreamland 3 and whenever I can get Dreamland 2 for cheap. And by the way, would it be better to get Super Star Ultra on the DS or Snes VC? How beautiful does this game look?! yeah this game looks absurdly amazing. I spent the entire trailer staring in enamored confusion. Cooperative play is icing on the cake. Although I'm usually not a big fan of Kirby games, this looks amazing. Will all these details even show up on my TV? Kirby's Epic Yam? Is anybody else reading this? In the sequel, you can use scissors to cut the world around you. It's called: Kirby's Epic Yam 2! This is quite nice and yes Guybrush, I also noticed how it seem's to read Kirby's Epic Yam if you're not quite focusing your eyes. This just in: NintendoLife changes the font on it's entire website so people stop reading "Kirby's Epic Yam"
Without Kirby's sucking ability this game will not be touching my wii. Anyways I have to save for games that look more fun like GS:DD, Skyward Sword, Donky Kong, and a 3ds with Paper Mario. This game looks like it is breaking Kirby tradition in a good way. Last game I saw that was different from the other Kirby games was Canvas Curse, which was an awesome game. I am deftinely going to be buying this on day one. This looks awesome and it's graphical style is so cute. Get Superstar Ultra for DS. It is so much better and has a few more games that add weeks of gameplay to trying to beat it. The last two games on it are the most challanging Kirby games I have ever played. Arenas that you must play as Kirbys helpers and try to beat all bosses- vey fun. Not to mention the rewards and movies you get to unlock. This is personaly my favorite Kirby game, besides Airide, to be created and trust me that I own alot of Kirby games. Also, you can play as Meta Knight on DS version. I have been playing it since it came out and still find enjoyment and a little frustration. I still need to beat Helper to Hero with Bugzie, Wheelie, and Birdon to unlock last 2 movies and officialy beat the game! Of everything I played at E3, this was the one that really left me dazzled. I'd seen the video sitting in the audience at the Nintendo Press Conference, but seeing the game actually played was fantastic. The level of detail and the way the fabric and yarn move isn't captured well by any video I've seen. This game really looks unique and beautiful, and co-op is awesome. That said, it doesn't have the platform controls of a Mario title. You can't run and jump and feel free like only Mario games deliver, but it is definitely Kirby, it provides the 'Kirby' experience in a fantastic way. Of everything I played, this is the game that I most want to personally show to Wii owners. It's special. I've heard that you don't/can't die in this game, you simply lose some of the gems you've accumulated, which would lower your overall rating at the end of the stage. Is this true? All great news! I'm PSYCHED for this game. Nintendo always has an awesome gimmick. Mario galaxy with orbiting around planets, Twilight Princess with Werewolf Link, and Kirby Epic Yarn with yarn. They can pull anything off. I'm sooo hyped about this game and DKCR , and this one has some splendid visuals (so charming ), sounds like tight controls, and, hopefully, fast paced gameplay, as KSS. This E3 showcased the return of awesome 2D platforming! And I'm loving it. Thanks for the impressions Corbie, you are the man . @WaveBoy BOTH AT THE SAME FREAKIN' TIME Okay I dunno. If you don't have a Classic Controller it's not worth buying one, get Ultra. If you do have a Classic Controller, get VC. Leave it to Nintendo to make fabric so appealing. This is both so adorable and jaw-dropping impressive at the same time. I would be out of my mind not to buy this. I can't wait for this game. Hopefully it doesn't suffer the same fate as Hoshino No Kirby. I've been a Kirby fan for a long time so this is must have for me. I'm glad they have changed the formula for this one even though sucking up baddies and floating is still fun even to this day.The change should freshen up the series a bit, and it looks like a blast so i know i will enjoy the new gameplay elements. I have to admit that I've never been a huge Kirby fan. Even though they were fun, I was always disappointed by how short they were and how they typically weren't that challenging. In spite of that, I am so in love with how this game looks and plays that I'm probably going to buy it regardless. Even if it ends up being less than 3 hours long. 1st off, can't wait for this, but think I am more hyped about DKCR... but am I the only one that sees all these textures and this visual style as being heavily inspired by Sony's Little Big Planet? can you die in this game?